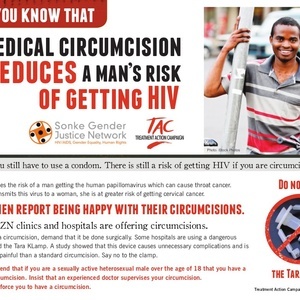 Published: Sept. 19, 2012, 1:42 p.m., Last updated: Sept. 19, 2012, 1:59 p.m.
Circumcision advertisement being run by the Treatment Action Campaign and Sonke Gender Justice. Neels Blom's anti-circumcision article is deeply flawed and shows a poor understanding of science. In 2007 the World Health Organisation (WHO) and UNAIDS convened a meeting to consider all the evidence on medical male circumcision (MMC). A large number of scientists, some opposed and some pro-circumcision, attended. This meeting concluded that the evidence for MMC was compelling. It recommended that voluntary MMC should be implemented as a prevention intervention in countries where HIV prevalence was high and male circumcision prevalence low. The most compelling data was from three randomised control trials. In contrast to Blom's claims, these trials were of high quality. Blom says, “The first two studies were prematurely abandoned and thus invalidated.” All three trials were stopped because the circumcision arms were so effective that continuing to not offer circumcision to the control arms would have been unethical. This is standard in clinical trials. Opposite to invalidating the trials, the early end to the trials affirmed just how effective circumcision is at preventing HIV transmission from HIV-positive women to HIV-negative men. The Bophelo Pele project --on which Blom again did not have the facts straight-- is in fact not a trial, but a Phase 4 study, conducted to see what the community level impact of MMC would be. In other words, does the protection we saw in the trials carry over to a community if it is implemented? This study has already shown a 74% reduction in incidence for those who have been circumcised in this community. Although very early, there was even a significant reduction in prevalence of HIV in this community. There was no evidence of behavioural risk compensation either. So on a community level there is already scientific evidence that MMC works as an intervention. Blom's cites a paper in the Journal of Public Health in Africa. We assume this refers to a thoroughly discredited paper by Van Howe and Storms. These scientists quote other papers to “prove” their point, while the papers they are quoting actually refute their arguments! In a reply to the Van Howe paper, a number of world renowned scientists wrote that the article “contains ... unsupported claims, sources that either fail to support or contradict the claims attributed to them, errors in calculations, fallacious reasoning and selective citing of evidence. Previous publications by the first author of the article have been severely criticized” 1. We assume that the Journal of Law and Medicine paper quoted by Blom refers to the paper by Boyle and Hill. This paper has also been severely criticized for its bizarre analysis of trial data. Trials are designed to use a specific analysis of the data and self-invented statistical methods used in the paper will result in strange and inaccurate findings. As far as the claim that observational studies of general populations have not shown a protective effect of MC, this couldn’t be more incorrect. The first study Van Howe uses for this argument is a 16 year old study that did not adjust for cofounding factors. The second study contradicts what Van Howe is arguing. The third study quoted is a meta-analysis by Van Howe himself, which is used in textbooks to demonstrate how inappropriate methodology can lead to wrong conclusions. Every correctly performed meta-analysis of MMC data from a number of countries has shown a protective effect. We are not sure what Mr Blom means with “myths” around Herpes (HSV2) and Human Papilloma Virus (HPV), but there is again compelling clinical trial evidence that MMC provides protection against both. Blom's contention that MMC is a hare-brained idea shows his lack of knowledge and understanding of the issues of HIV prevention and science. It is shockingly misinformed. The MMC program is based on sound science by reputable scientists and has already shown a reduction in new HIV infections. Blom's attempt to create opposition between circumcision and antiretroviral treatment is ridiculous. Circumcision will reduce the number of people that need to be treated. Both interventions are effective and both are necessary. We can all say that 'he shows a poor understanding of science'. I find no links to this 'compelling' data that you're talking about. I'm pissed off that you're posing as oh so rational 'scientific', ridding the world of quacks. Seems to me that your the quacks, giving out garbage information like this. There is NO plausible mechanism! It's about as plausible as cutting off your eyelids to reduce the risk of conjunctivitis.